Welcome to the Thermistor and RTD Probes & Assemblies Technical Center! 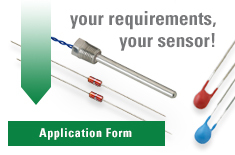 The Technical Center provides you with information, downloads and links to the most up-to-date resources on our temperature sensor products as well as answers to some of our most commonly asked questions. For Sales Assistance, please contact our Sales Support at 800-777-6467.